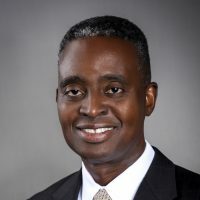 Akeem has over 25 years of experience leading operational and strategic improvement projects. His consulting experience spans numerous industries including utilities, financial services, consumer goods, wireless telecommunications, commercial airline manufacturing, transportation and logistics and multi-site property management. Prior to joining EHS, Akeem spent four years with McKinsey & Company, where he helped clients adapt to the transformational changes brought on by the mass adoption of the Internet and mobile communication. Akeem spent three years at Citigroup as a corporate finance associate, advising clients on merger and acquisition transactions and helping to structure complex asset-backed securitizations. Akeem earned his MBA from Stanford Graduate School of Business and his M.A. in International Development Economics at Stanford. He earned his B.A. in Applied Mathematics at Harvard University.